HTC Vigor to be Renamed “Thunderbolt 2”? Samsung Prime Replaces DROID Charge? OK before we start, we should make sure that everyone knows that we know that there are spelling errors like a mutha up in this leak. It could be legit, but truthfully, we have no idea. According to the source – who happens to be a Best Buy employee – this document was handed out by Verizon reps (we’re thinking regional) and describes the expected lineup for them in the near future. It includes a whole bunch of devices that have long been rumored, so there are a couple of things we should think about with this: could be someone compiling all of the stuff we have been talking about for the last month and splashing it down on paper or it could be legit and the guy just can’t type. So with that said, let’s talk about what we are seeing. While the Stratosphere is up there as replacing the Fascinate, we are more interested in comparisons two and five lines below that. Thunderbolt 2? The Thunderbolt 2 is as many of you know, the HTC Vigor (first pictures). In a leaked roadmap back at the beginning of August, we saw then that this device would be replacing the original Thunderbolt – a device that has really only been out for 7 months. Is Verizon planning to rebrand it as the Tbolt 2 though? Interesting idea. The original Thunderbolt went by the model number ADR6400 and the Vigor is already listed as ADR6425, so it would make sense to re-use the name similarly to what was done with the Incredible and its follow-up. What about the “Sam Prime“? That would be the Nexus Prime or DROID Prime or whatever the hell you want to call it that is expected to be one of the first Ice Cream Sandwich devices on the planet. 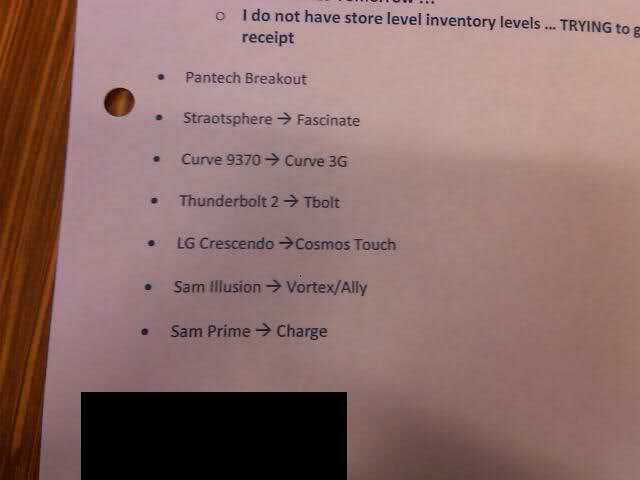 According to this document, it will replace the DROID Charge which to be honest, makes a lot of sense. The Charge went by model number SCH-i510 and the Prime has already been outed as SCH-i515. The Charge is also in a similar predicament as the Thunderbolt in that its specs are from 1992 (yeah, exaggeration) and is in dire need of being upgraded. No details on a release, but so far we have an October 6 date for the Vigor and a potential November time frame for the Prime. Seriously, September can’t possibly go any faster.